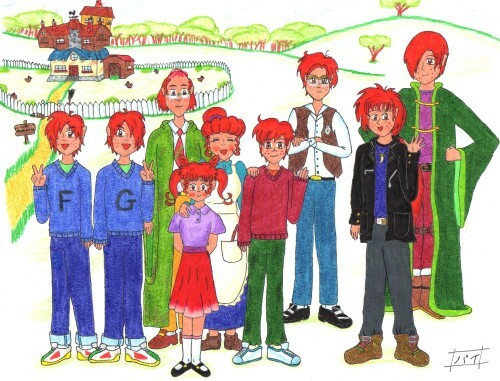 Harry Potter: Meet the Weasleys! Minitokyo »	Harry Potter Indy Art » Harry Potter: Meet the Weasleys! Again, with my second submission. This drawing is from 4 years ago too, as the Lockhart one. I tried to depict them just the way I imagined them when reading the fourth book, when they receive visit from Charlie and Bill, and everyone in the Burrow helps in making a dinner outside the house. I had some trouble trying to imagine what kind of clothes use each member of the family. As you can see, I ended up putting them Muggle clothing ^_^' with a few exceptions, such as Charlie's special clothing to tame and handle dragons, Billy's dragonskin boots, Percy's professional appearance, etc. :) Comments, critics and tomato throwings allowed! May the Valar be with you! Browse Harry Potter Gallery: Recent | Popular. I have difficulties with clothes too, but is normal xD Remember: I'M YOUR FAN!